The summer is a great time to spend the day lounging by the pool, soaking up the rays, and cooling off in a pool. However, swimming in a dirty pool is not ideal, especially when it comes to algae, bugs, and other debris that will gunk it up. Cleaning your pool is easier than you might think. In this article, you will find five ways to take care of your home pool during those hot and humid summer months. Each pool has a skimmer basket that collects bugs and debris that fall into the water. The job of the skimmer is to clean the surface of the pool so debris doesn’t become overly saturated and sink to the bottom of the pool. Once your skimmer becomes full, it does not clean as well, which is why you should be cleaning out your skimmer basket at least once a week or more. If you notice that debris is starting to float in your pool, you might want to check your skimmer basket to see if it is full. One of the ways to take care of your home pool is by checking the water level. There is a delicate balance that needs to be maintained for your skimmer to work properly. If the water level is too high, the skimmer door will be unable to open and close as it should. If the pool water is too low, your pump will be dry, and it will burn up the motor. 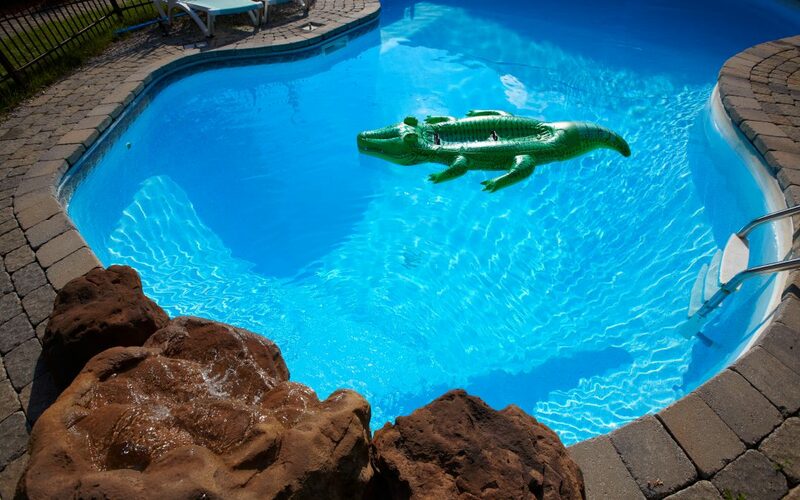 It is important to keep the water level at the ideal height to avoid having to make costly repairs to your pump or having too much debris in your pool. Cleaning out your pool filter is critical for the life of your pool. Without the maximum flow through the filter, debris will pile up and cause your pool to become excessively dirty. Changing your filter on a regular basis helps keeps the water crystal clear and clean. You can always clean out your filter as well by washing it out according to the specific cleaning instructions. Every four to six months is the ideal time to clean your pool filter, though it depends on the size of your pool and how often you use it. If you have an in-ground pool, the tops of your walls may be made of tiles. If they are, you should be wiping your tiles down and cleaning them on a regular basis. This is important because tiles tend to catch hold of build-up from various chemicals within the pool water. Cleaning off the tiles helps reduce this build-up and lowers the risk of chemicals creating a scum line on the walls of your pool. If you have fencing around your pool, you need to check the gates and all protective barriers on a regular basis to ensure that they lock properly, are not loose, and close completely. A broken gate can not only be a nuisance, it can also be dangerous, especially if you have small children around your pool on a regular basis. Gates that swing away from the pool are a good idea, and self-closing or self-locking gates can also be beneficial since they lock on their own when closed. Your pool is a fun and exciting way to keep cool and have fun during the summer months. However, taking care of your pool is important for its performance and cleanliness. By using the tips above, you can better take care of your home pool during the warm months to give you some good clean fun to beat the heat. Gable Home Inspections provides pool inspections as well as a variety of home inspection services to Southwest Florida. Get your pool ready for summer and contact us to schedule your pool inspection today.